Rabtherm builds total energy systems with guarantees of power in kW and temperature for the need of the customer. The system includes sewer pipe, heat exchanger, connecting pipes, any type of heat pumps (electric, gas motor, absorption), peak boiler, all installations in the energy plant, control systems. We designed and installed the first absorption heat pump 20 years ago. The patent of an Anti-fouling-System to prevent the formation of slime (biofilm). The new material developed by Arcelor-Mittal (chrome steel) provides improved thermal conductivity by about 80 percent. A supervisory control system for bivalent systems with alternative energy sources. Rabtherm is always ahead in research and development, having invented an anti-fouling system to prevent the formation of an insulating biofilm and a new heat exchanger material with a 80 % better heat conductivity. The two inventions brought Rabtherm 40 % ahead of the present market solutions. A new overruling control system brings 15 – 20 % less operating cost, controlling waste water flow, operation of the heat pump and the peak energy system. Thanks to all these new developments it was possible to increase the heat extraction rate by up to 40%. That means, without the anti-fouling system and without the new ferritic steel, the heat exchanger chains would have to be 40% longer.Together with a bivalent process control system, sewage heat recovery plants now score with a return-on-investment of 2 - 6 years. It is a requirement of the time that we recycle waste heat from industrial or domestic uses. What happens with the waste water? From the eyes, from the sense? To use these resources was the entrance to the idea, to the energy system RABTHERM. The waste water has a medium temperature of over 25°C (77 F) when leaving the houses. In drains the annual average is 15°C (59 F), (summer 18-22°C / 64-72 F, winter 10-12°C / 50-54 F). The waste water is a constant, renewable energy source on a comparatively high temperature level. With modern heat pumps one reaches thereby usable temperatures of 65-70°C / 149-158 F, sufficient for warm water production and for heating new buildings. The heat existing in the waste water of housings, trades and industry should be used decentralized. The temperature level is higher than with most other natural, regenerative energy sources. The system can be used in winter for the production of heating water and domestic warm water (whole year) and in summer with small additional investment for production of cold water for air conditioning systems (6°/12°, 43/54 F). The idea is not new, but as of today only cleaned waste water was used after from purification plants. Because many purification plants lie however at the edge or outside of settlement areas, with large distances from the heat consumers, this strategy is uneconomic. The goal of the R&D department was to develop a simple, robust, economical and durable system which can be used both in existing and in new channels. Critical success parameters, which affected the development considerably, were an outstanding economy and environment-friendliness. The lack of a suitable heat exchanger with very high heat transmission coefficient, which could avoid - when built-in - blockages in the channel. These challenges to the development were solved technically and economically. The system RABTHERM was constantly developed since 1998 and used successfully in many facilities world-wide. Investigation of the influence of waste heat utilization on the clarifying process in waste water cleaning plants in co-operation with EAWAG, Switzerland. 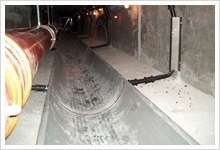 Installation of treated and untreated steel plates into sewers for the clarification of the corrosion and erosion behavior. Annual control and measurement of the metal întensity as well as the long-term behaviour were accomplished in co-operation with EMPA, Switzerland, and the Swiss Institut for corrosion protection. As a final result of this development phase RABTHERM heat exchangers were certified with a minimum life span of 50 years. Execution of numerous feasibility studies and development of an own computation method for the regulation of hydraulic and thermal system parameters for the practical system implementation. Proof of economy, environmental compatibility by numerous studies and scientific research work. Optimization of the heat exchanger structure with an Anti-fouling system on the surface of the heat exchanger. The patented solution successfully prevents the degradation of the heat transfer during the operating phase. Buildings with high heating and/or cooling demand. Compared with conventional energy sources, RABTHERM systems provide many advantages. Here wie have colleced son Reference projects for you. A complete list of all projects is available on demand. We are glad to present our reference projects in a personal presentation. So far the warm water from showers, washing machines and buckets flows unused through drains up to the next sewage purification plant. The Rabtherm principle is simple and efficient: The lukewarm waste water is cooled down around maximum 2,0 °C (3,5 F) (maximum 0,5 °C / 1 F over a 24-hour-day). The energy is transported by long-distance pipe to the respective buildings. By heat pumps the temperature is brought up to 65 °C (150 F) for heating and warm-water supply. In the heat exchanger, heat is extracted from the waste water and supplied through an intermediary thermal unit heat carrier (ITUHC) to the heat pump. The ITHUHC (pure water) between heat pump (heat production) and heat exchanger (extraction of heat) runs through a plastic tube. 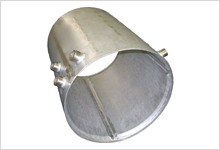 A distribution pipe feeds each of the 1 to 3 m long heat exchangers. Afterwards the ITUHC is collected in the return collecting pipe and flows back to the heat pumps. 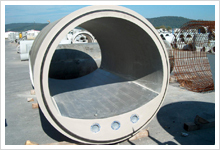 The heat exchanger is built in a concrete cast iron or plastic sewer and has a service life of at least 50 years. Corrosion, erosion/abrasion, tightness, fouling, channel maintenance and cleaning are some factors, that influence the strict quality assurance criteria on material choice, construction, production (welding) and assembly/installation. Parallel to the quality assurance also all possible remedy scenarios were set according to „the principle“ determination-identification-repair. The heat exchangers can be installed both in drains of new buildings and when reorganizing existing systems. A cubic meter waste water, corresponds to about five bath tubs, in this case the heat exchanger wins two to three kilowatt-hours energy. An energy-saving lamp burns 200 to 300 hours. In this way a RABTHERM facility can reduce fuel consumption by 60-70 %. Even with a tubing downward gradient of under one per cent or in overflow channels the system can be used. Power after heat pump, approx.. 2-5 kW/m2 heat exchanger. How much costs the energy system of RABTHERM? The heat exchanger as an element without installation costs approx. 8-15% of the total system value. The saving of operating cost changes due to different heating systems and can amount up to 50 % of the annual costs. The RABTHERM system is nationally supported in most countries. Returning time on investments can be lowered by 30%.